Candace H. Johnson Adam Heisler, lead vocalist, sings with the band, 7th heaven, during Grayslake Summer Days on Whitney Street in Grayslake. 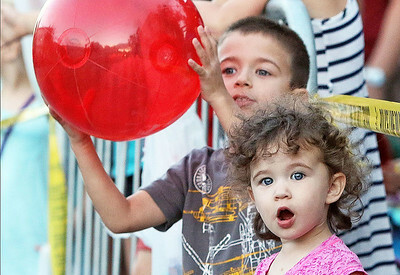 Candace H. Johnson Connor McGann, 5, of Grayslake and his sister, Claire, 2, watch the Grayslake Summer Days Parade on Center Street in Grayslake. The siblings were at the parade with their mother, Jayme. 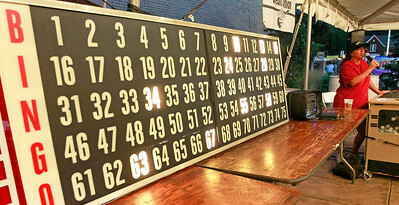 Candace H. Johnson Rhonda Harden, of Zion, calls the numbers in the Bingo tent for the evening crowd during Grayslake Summer Days on Whitney Street in Grayslake. Candace H. Johnson Chelsea Deal and Rayne Janiak, both of Grayslake, play Bingo at night during Grayslake Summer Days on Whitney Street in Grayslake. 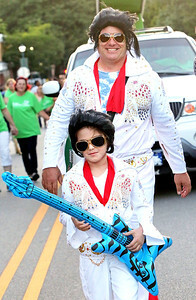 Candace H. Johnson Ron Jackson and his daughter, Molly, 10, walk together for Caliber Home Loans in Grayslake during the Grayslake Summer Days Parade on Center Street in Grayslake. 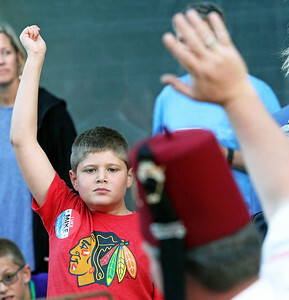 Candace H. Johnson Mathias Goldberg, 10, of Grayslake watches the Medinah Shriners wave to the crowd in their fire wagons during the Grayslake Summer Days Parade on Center Street in Grayslake. Candace H. Johnson Grayslake North's Peyton Bergerman, 17, drum major, takes the lead for the Marching Knights during the Grayslake Summer Days Parade on Center Street in Grayslake. 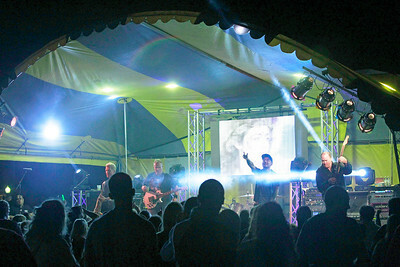 Candace H. Johnson The band, 7th heaven, in concert during Grayslake Summer Days on Whitney Street in Grayslake. Candace H. Johnson Mayor Rhett Taylor throws out some candy to the crowd during the Grayslake Summer Days Parade on Center Street in Grayslake. 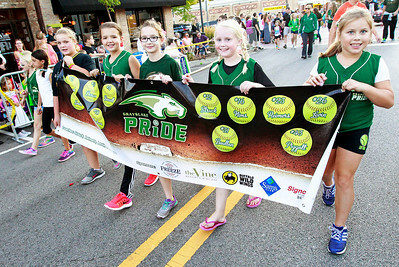 Candace H. Johnson Grayslake Pride softball players walk in the Grayslake Summer Days Parade on Center Street in Grayslake. 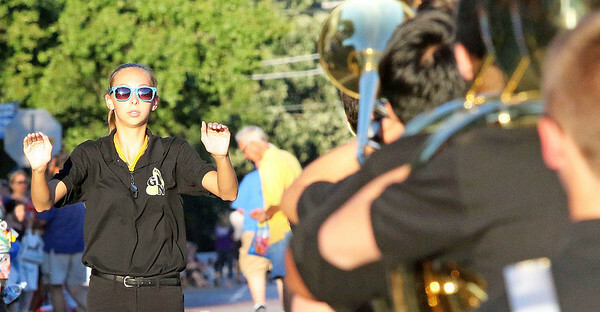 Grayslake North's Peyton Bergerman, 17, drum major, takes the lead for the Marching Knights during the Grayslake Summer Days Parade on Center Street in Grayslake.